Hmm. Where do I start. I’ve been absent from my blog for a while now. All the online options that are available to you today have been a bit overwhelming. 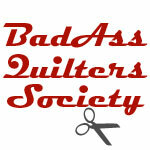 I’ve been a lot busier with quilting customer quilts and I’ve made a conscious choice to limit my time spent online. As a result, this blog has suffered. It’s not like I haven’t had news worth sharing either. I have some pretty exciting news I plan on sharing in the next few weeks; but for now, let’s play a little catch up…. 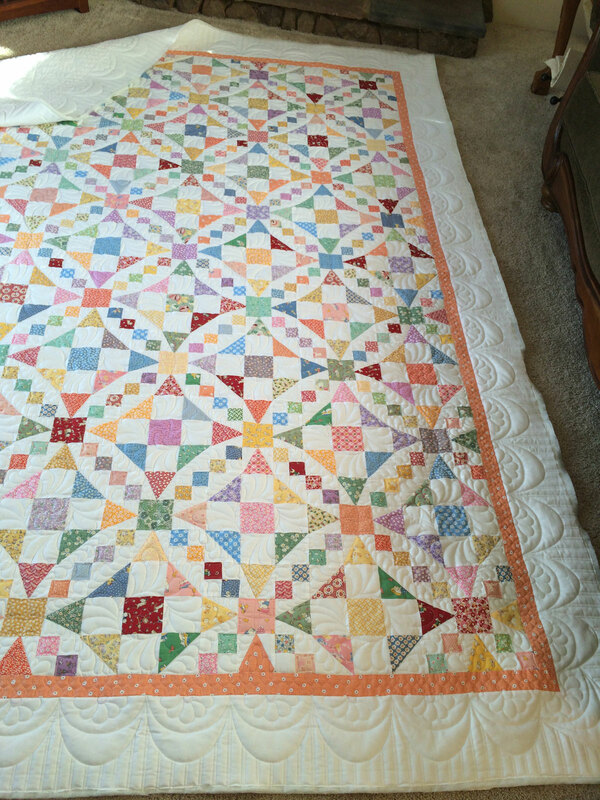 This quilt was a rush job for a customer’s daughter’s graduation. I seriously loved this one. 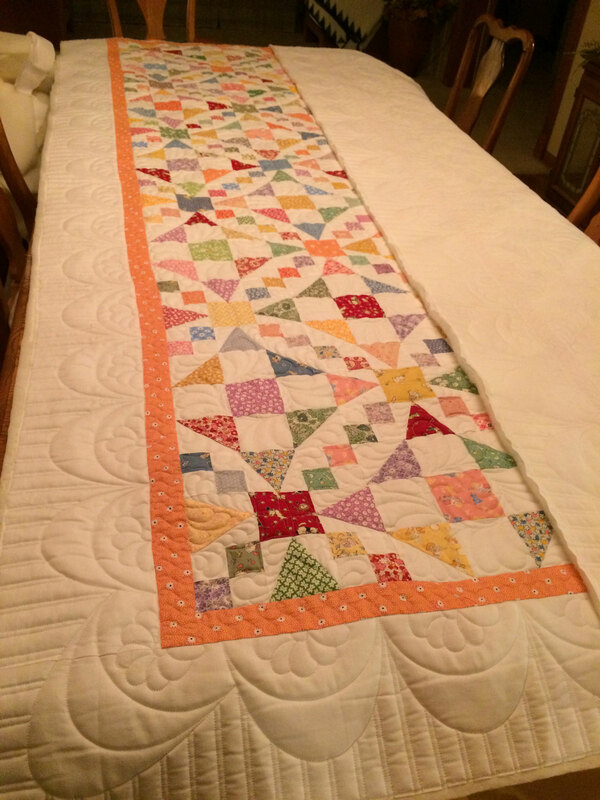 From the fabric to the design, it’s a classic quilt that will be a heirloom for years to come. 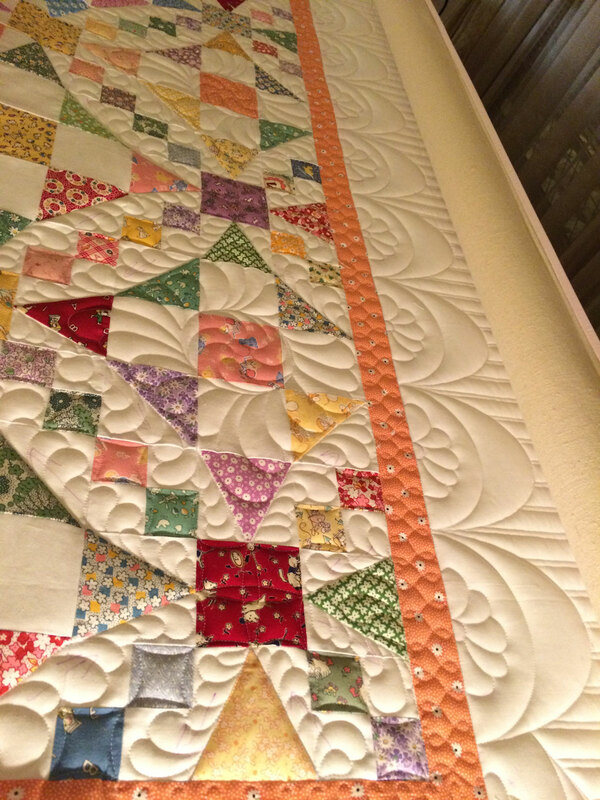 The fabrics led me to a more traditional approach to the quilting design. I chose to use swags in the outer border. 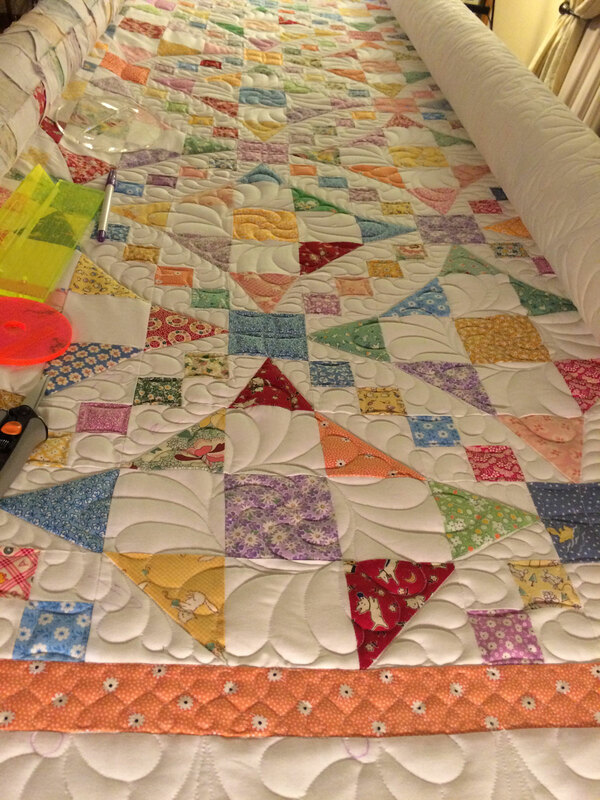 Once I figured out what to do with the blocks, I was able to find a continuous path across most of the quilt. It took 3 paths to complete one complete ring and each center ring was done separately with a feather wreath. I do plan on recording a video on how this is accomplished, so check back for that. 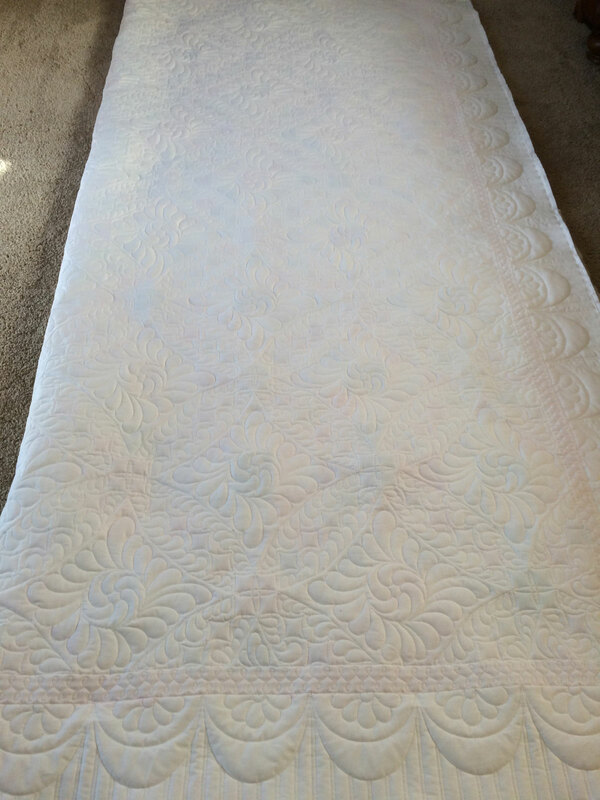 I used Quilters Dream wool batting (my favorite) and So Fine thread on top and Bottom Line on bottom. 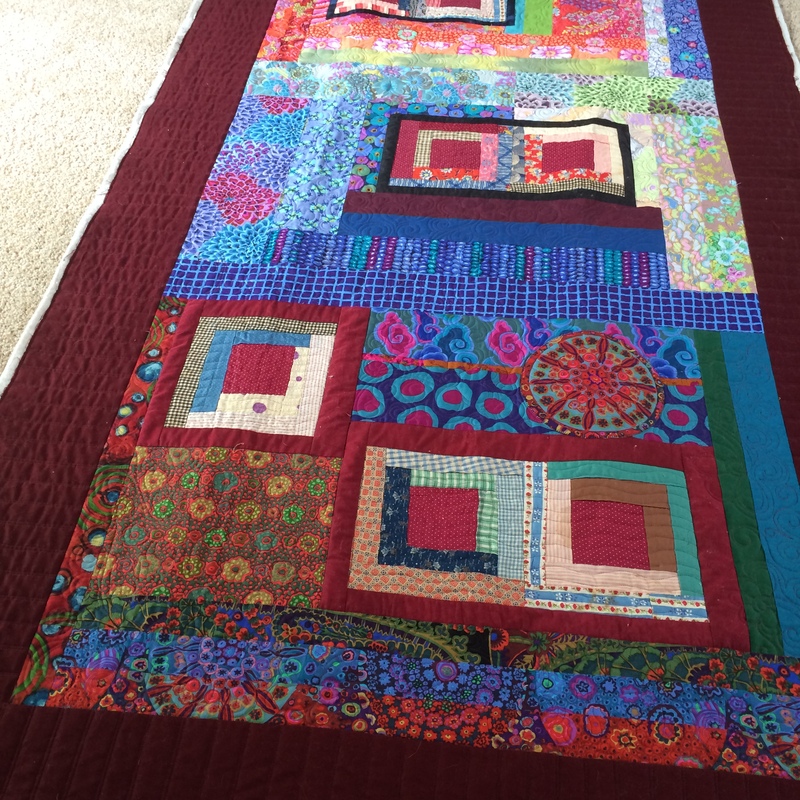 I love this quilt and I’m sure the granddaughter will love it too. 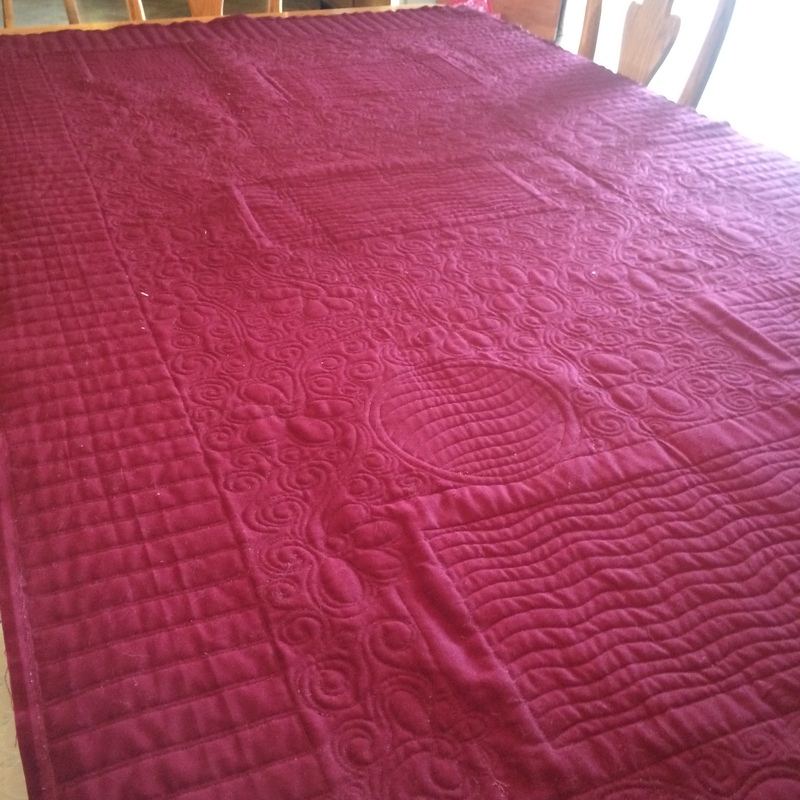 This is a little mini (18″x18″) wholecloth that was part of Lisa Calle’s online wholecloth challenge. The challenge was to design a wholecloth design using Robert Kauffman’s Radiance silk blend fabric. I used this yummy fabric and I LOVE LOVE LOVE it. 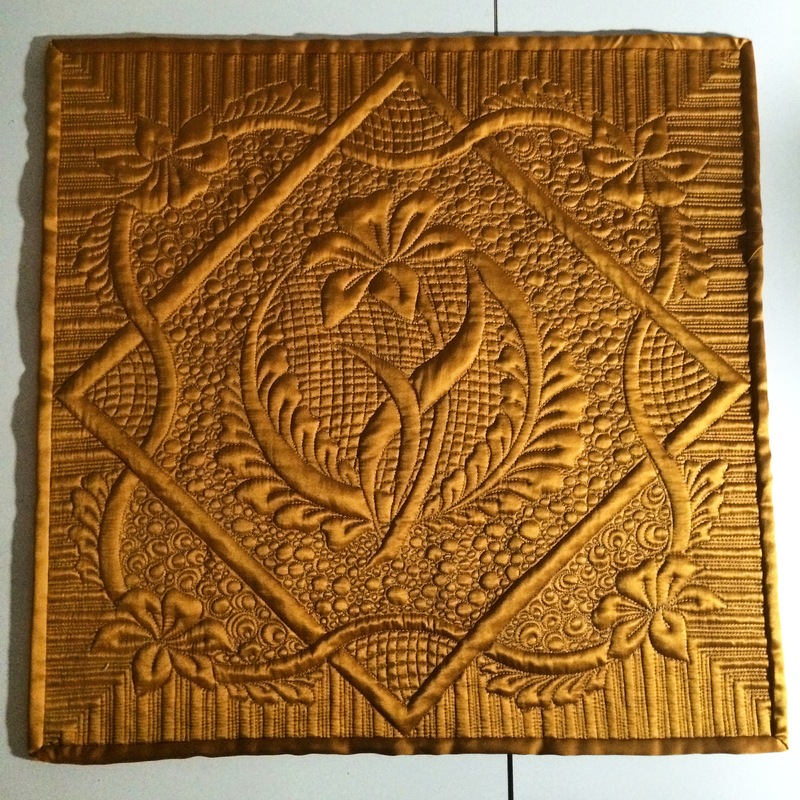 I used Superior Kimono silk thread on this and I loved it too! Lot’s of love on this quilt. I want to do a larger quilt with this fabric and have been kicking around some ideas. Some day – soon – I’ll get the design down on paper. 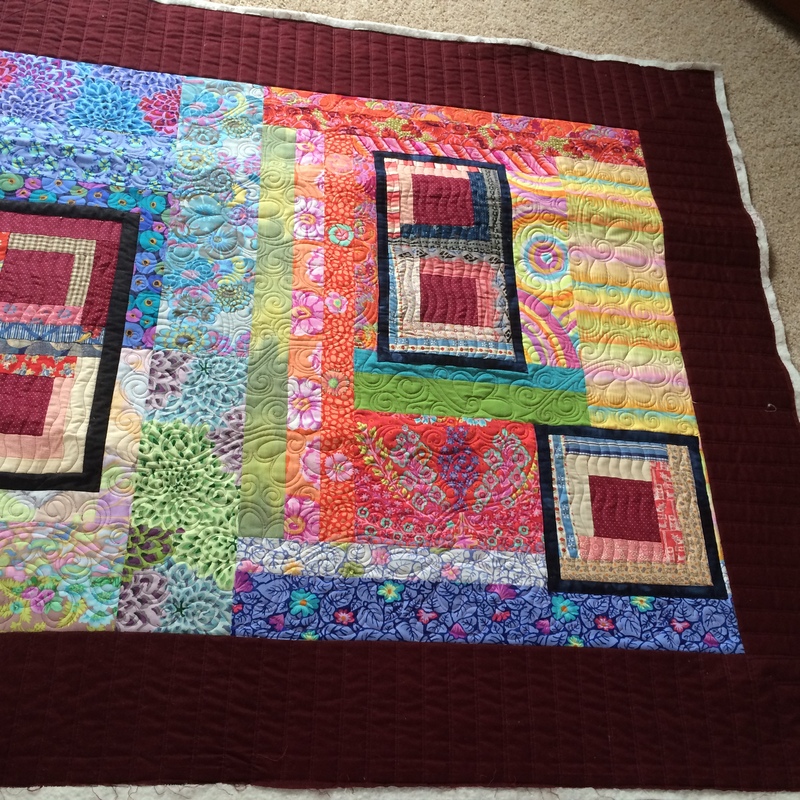 This is a lovely little quilt designed by a good customer and friend – Cheryl. 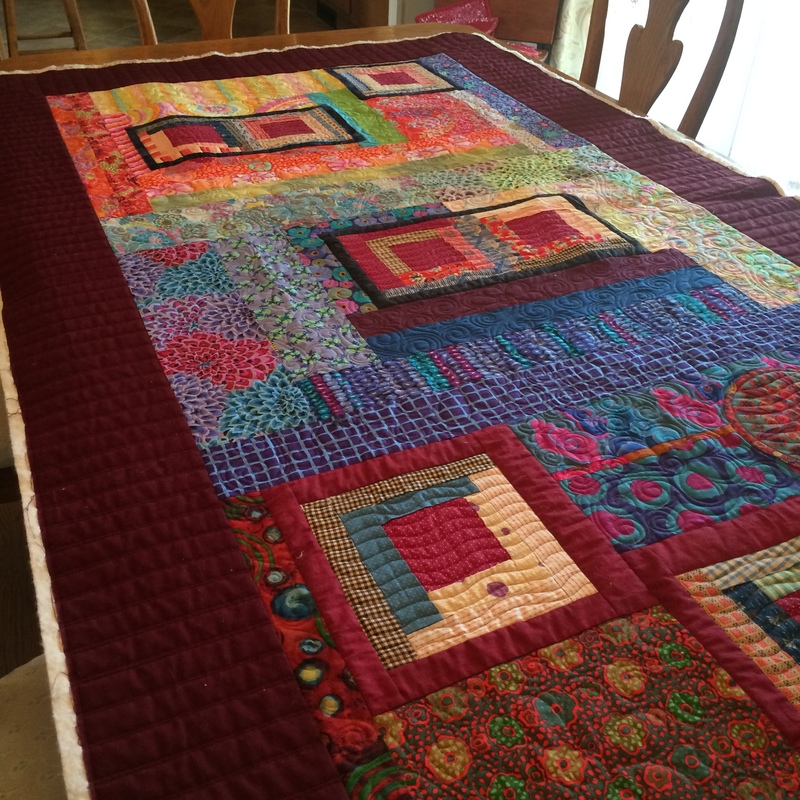 She used some vintage blocks she was handed down and surrounded them with the bright Kaffe Fassett fabrics she loves to use. I seriously love what she did here. It is a perfect combination of old and new. 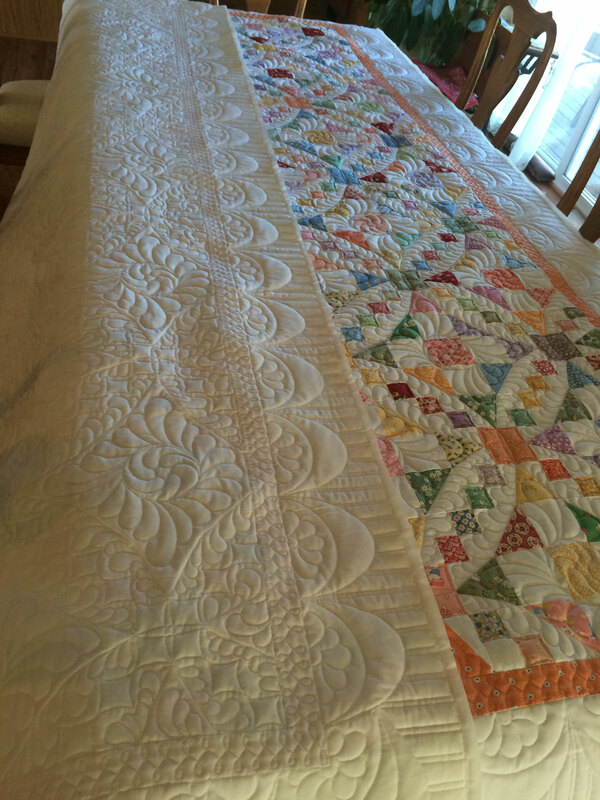 I promise to share some more beautiful quilts soon. I’ll be in Paducah next week – anyone else going? Message me to meet up! I’ll be there with a friend from Wednesday evening through Saturday.